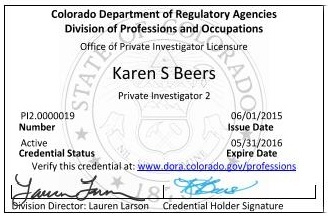 Colorado's voluntary licensure program was repealed in June 2014 after the passage of mandatory licensure, which will be effective June 01, 2015. At that time ALL persons asserting to be a private investigator and providing services defined by statute will have to be licensed. Reporting of operating without a license is mandatory - and with the cost of licensure, reporting non-co﻿﻿mpliance assures both consumer and professional protection from unlicensed activity. 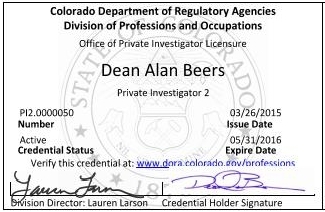 Colorado is effective June 01, 2015 - Karen is PI.2-0000019 and Dean is PI.2-0000050. Level II - Demonstrating 4,000 hours or greater of experience (education can be included for up to 2,000 hours). Please visit http://www.ColoradoLicensedPrivateInvestigators.com for details. We have an office serving northern Colorado (CO) and have relationships with investigators all over, from the capital city of Denver to every major city and metropolitan area. In addition to our full legal investigative services statewide, we also accept expert cases, including court appointed. Be sure and contact our office to learn how we can help you.